Dorfman Pacific's Solarweave Mesh Trekker goes a long way toward solving the most vexing problem about hats: they tend to overheat your head. The sides of the Solarweave Trekker are made of breathable mesh, allowing air to circulate freely around your head, and making it feel (almost) as if you were hat-free. Despite the airiness, the top of the crown is solid, which combines with the hat's sturdy and wide brim to give you outstanding SPF 50+ sun protection. While not a crushable/rollable hat, the Trekker is quite comfortable, with a CoolMax™ cotton/polyester lining to absorb sweat and dry quickly. The brim is made of a heavyweight cotton, and is stiff enough to weather significant breezes. This is the hat I took on my 50-mile Pacific Crest Trail hike, and I was very pleased with its performance. Typically I pull my hat off every time I get into a shady spot to cool down. With the Solarweave Mesh Trekker, my head stayed noticeably cooler and more comfortable compared to my other sun hat. Since the Trekker isn't really crushable, it isn't as good in situations where you'll want to easily stuff your hat into your backpack. The hat does flatten, however, so it will fit into a suitcase provided you have enough room for the brim. Speaking of the brim, the Mesh Trekker has one of the widest brims I've found on a standard sun hat, measuring an impressive 3.25 inches. That's small enough to avoid feeling like a crazy sombrero, but big enough to give you terrific sun protection even as the day ends and the sun's angle starts to drop. If I could change one thing about the Trekker, however, I would make it lighter. 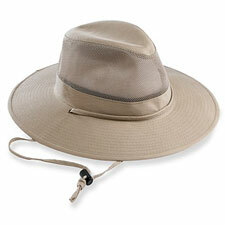 At 6.3 ounces (men's small, measured), the Trekker about doubles the weight of my lightest sun hat. You won't notice the weight if the Trekker stays on your head, but once again if you're going to be carrying it in your pack for any length of time, those extra ounces do add up. Overall I rate the Trekker a very appealing choice for warm-weather hiking when ventilation and sun protection are top concerns. Winter and Alpine users will probably want a lighter, more crushable design.